In order to follow this tutorial you will need to have set up two-factor authentication as described in the "Get started with.." user guides on: Office 365 - Two-factor authentication. Microsoft Autenticator is an app you can install on your smartphone that lets you log in with two-factor authentication. When you have done this, ths app will automatically change to be your preferred authentication method. You will be able to use SMS or your office phone as authenticaion if necessary. The advantage to using the app with a code is that the code is not available for anyone but you. This means that if your username and password get stolen, the person who has this information still will not be able to access your Office 365 account. 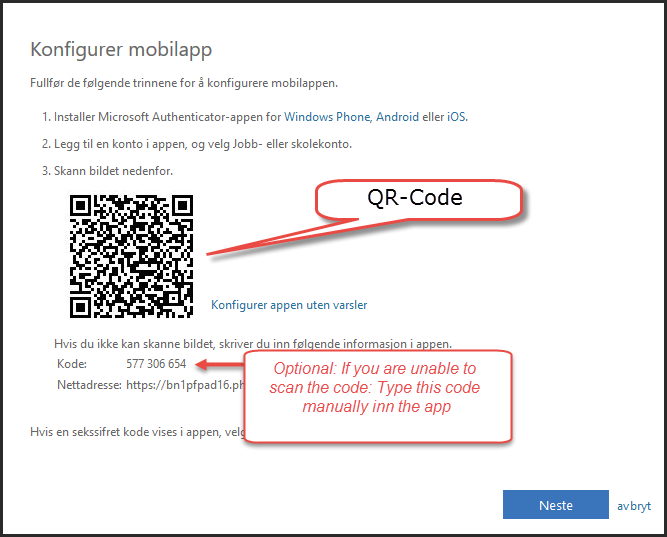 Find and download the "Microsoft Authenticator" app in Appstore (iPhone) or Google Play (Android). Do not start the app yet. Log in to the webpage https://aka.ms/mfasetup from your desktop computer or laptop. In the drop-down menu What’s your preferred option? Choose Use verification code from app [A]. 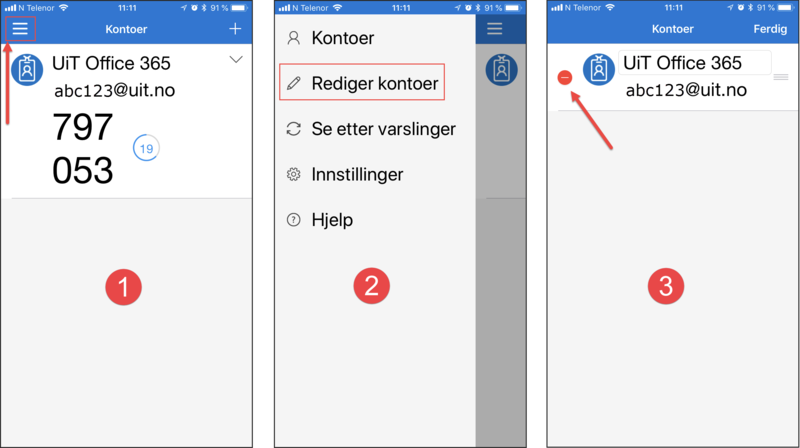 Make sure there is a checkmark next to Authenticator app [B] and click the blue button Configure [C]. You will now see a QR-code. Scan the code with your smart phone. Start Microsoft Authenticator on your smart phone and choose Add an account. Choose Work or school account. The camera on your phone will now activate at you can scan the QR-code you got from the webpage on your computer. On your computer, you will see that the webpage is checking your activation status. When it is done, you will get the following message: "Mobile app has been configured for notifications and verification codes". The advantage to using this method is that you only need to press approve in the notification from the app to approve your login. The disadvantage is that if someone tries to log in with your username and password, you will receive the approval notification. If you press “Approve”, the other person will have access to your account. Therefore, you must be 100% certain that the notification was sent regarding a login that you are attempting. If you are not sure why you got an approval notification, do not approve it. 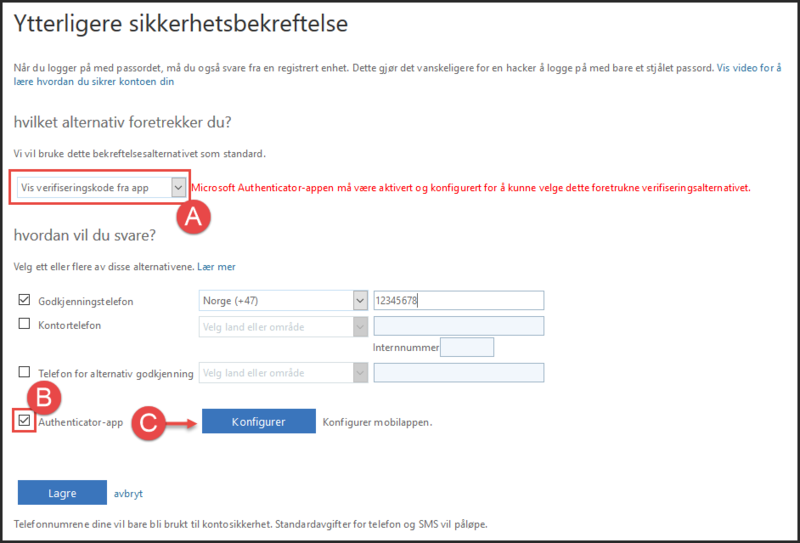 To set up Microsoft Authenticator with approval notifications, follow the steps above, except for step 3a. In step 3a, choose Notify me through app. If you have already set up the Microsoft Authenticator app, you do not need to do it again. Just press Save. In step 6, the website does not approve the authentication app. Try again but first delete the profile in Microsoft Authenticator and add your account again.